I mentioned in the previous article that nothing changes for me. And by that I don’t mean there is not constant change going on all around me every day. So what do I mean? I never knew what a blessing being able to make such a statement would be. If there is one thing I dislike, it’s boredom. So you would think, “nothing changing”, would be boring, but it’s totally not! It’s totally exciting because I wake every day knowing that no matter what may happen today, I still have the same vision! The same way of living. The me I have grown to be continues on no matter what! A worthy vision is like our guiding star! We don’t get lost in the night. T-H-E-R-E-F-O-R-E, “physical” things do not devastate me, change my plans, change who I am, change what my life is about. SO…even though a hurricane may be blowing over head, the lake within me remains calm, the waters unrippled, because I still get to live the life I want to live, a life in spirit. It’s a matter of the inner and outer principal. What happens outside me does not have to affect the vision inside me. I use different terminology when I refer to this at various times. I may speak of Godwalking, or God Balance, or God Task, and so on; but it all connects to the same inner vision which I got from Jesus, the Son of God: Live in the Spirit, not the flesh. Spirit is my life foundation. Physical things do not devastate me because my life is spirit. I do not dread even death, because only the flesh actually dies, my spirit will be released to pass through the next door of the supernatural. I sincerely believe we have a Creator who has prepared a place for those who do not reject their Creator, but honor Him through His will through Christ Jesus. So no matter what each day brings, by faith I seek Holy Spirit, and together we Godwalk, maintaining a God Balance. But again, this is not the formula we will soon share. This is still the product of the formula. To do this I became a Priest through Christ Jesus, the High Priest after the Order of Melchizedek. I don’t mean I wear a white collar or anything, but salvation in Christ brings us into a Priesthood, and our focus becomes “Spirit”, more than flesh. There are many thing in this physical world I get to enjoy. As a matter of fact, living in spirit seems to enhance the flesh, because by the wisdom of God we avoid many painful mistakes. My wife and I are still very much in love. We have been married 41 years and have 5 great kids who love coming together as a family. And now dad is building a Teepee in his old age, of all things, for the 7 Grandkids, and the family to come together for great times. Also many ministry opportunities have been happening at this special place, even though it is far from completed. God has proven he don’t need a finished product to use it. The Teepee stands as a direct challenge to many people’s way of life. It’s a picture of simplicity, serenity, peace, the beauty of nature, the joy of an early morning song bird, it causes people to consider a different way of living and just maybe realize all this world’s “stuff” and “fun” are not the answer. They will never satisfy your SOUL! And your soul is the real YOU, not the thing you see in the mirror. We see spirit, not flesh. Soul Peace is only found one way, a life in spirit. By that I mean your spirit, and God’s Spirit, joined together, walking together, Godwalking in a godly balance. This is what we’re teaching in these articles. We have peace, and we teach peace. Soon we will begin examining what I’m calling “The Formula”, what Jesus did to have a vibrant Spirit life with the Father. We think about these things and write about these things because our life is not shallow and complicated, but deep and simple. So says Grandpa White Feather. More to come soon. Hope you enjoy. Drinking black coffee while thinking white thoughts in a peaceful place, my inner man. We start with a deck. Turtle Gardens Forever! (TGF) Slow down and hear God. If we succeed more pictures will follow. Garden going very well here at our house. It is already popping with new beauty and life even though there is so much yet to go. It’s amazing how much beauty even just a little garden can offer. Don’t forget to check out our previous articles of “Infinity War” if you like a trip down a spiritual rabbit hole! In the meantime our Tipi Retreat, which is where today’s garden starts, is still developing. The Quest continues. / Day 2. I have done vision quests in which I felt I was hearing nothing the whole time. We even included fasting as part of those quests, but I was hearing nothing. It was a test of faith and we continued though hearing nothing. All the “hearing” came “after” the quest. The quest was spiritual preparation and testing. However, this God-Seek did not include fasting, and yet God spoke from the very first night in such powerful ways! I am only going to speak of the powerful ones in this blog site. There were many little ones also, but they allow much speculation as to whether it was God or not. Those are for my own heart to judge. I’m only speaking here of those so unusual and beyond our control that it is hard to deny some unseen force was involved. From a little child I have been raised to know His voice. Perhaps I will eventually share the encounter with God I had at a Bruce Lee movie when I was early twenties, I think? That changed my life and put me on such a path as I have traveled all these years now. DAY TWO: The big thing on Day 2 was to climb “Bear Butte”. This is the place books say the Indian, Crazy Horse, had a great vision. I was hoping to hear from God there too. We were not actually in Black Hills yet, but this was sort of on the way. I had climbed it twenty years ago, now I was back, and this time my wife hoped to climb it with me. Please understand, my wife had never done one of these vision quest with me before. This was a first for her, and she is not the rugged outdoor type. This was going to be a great challenge for her to climb Bear Butte, even though it was easy for me. My challenge would be a place called “White Butte”, and also “Harney’s Peak” in the Black Elk wilderness. I actually did not expect her to make it all the way to the top. I figured she would climb for maybe an hour and then see a nice spot she would stay while I went the rest of the way. But she had caught the vision of the vision quest. She knew she could not climb the other places I was going, so I did not know, but she had determined if at all possible, she was getting to the top of Bear Butte! So we hiked and hiked that day, following the rugged path winding its way slowly to the top. She stopped many times for rest, but always got back up to go again. It took us over two hours to get up there, but she finally made it and I was so very proud of her. It was great to be able to share what was going to happen up there. She would witness it first hand, not just as a second-hand story I would tell her when I came back down. It was a beautiful day, bright with sunshine, but we also found snow on the path as we got higher. It was a white path at the top. (Church of the White Path?) The views were amazing, and when we finally reached the summit, we found a nice spot in a few evergreen trees and settled in. We had coffee, snacks, and my Bible with us. Here is where the story gets interesting. The view before us is spectacular. A wind sweeps across the top in the bright sunshine, and there are many Indian “prayer cloths”, brightly colored, yellows, reds, blacks, blues, whites, hanging from the trees and blowing in that wind. It’s hard to describe the feeling I get when I’m up there, but my wife and I were there together, and so was God. It had been a slow trip up, but we had made it. I do a teaching called: “What’s in a name?” The spiritual name for my wife has become, “Turtle Faith Lady”. She has always collected turtle ornaments, and the name is very fitting. The trip up Bear Butte confirmed her name. Slow, but full of faith, sacrifice, and determination. This had been her climb of the quest. God was now going to speak. My Bible was in my hand and I was trying to figure out what to do with it? How was I feeling led, as the sun shined, the wind blew, and prayer cloths waved before us? I thought about flipping it open to see where it would land, but somehow that just didn’t feel right. There was something else. You see, the documentary was very special to me. I have done a lot of teaching about the differences between the Christian who lives like a flapping little sparrow, and the Christian who lives in the high places and soars like the eagle. This movie was about the very first female who was being trained to be an “Eagle Huntress”! It is a very special thing a nomadic tribe in Turkey do, but it has always been just the men. Now for the very first time, a young girl was training with an eagle, and was going to compete in a great contest with other Eagle Hunters! This card was so special to me, and where had it landed? Would God speak to me there? IT seemed perfect. It seemed right. So I opened my Bible where the card was marking and purposely focused on the first place my eyes would fall, not knowing what it would say. There is a special point to be made in what it said. I think it would be best to make that the next article. The name of the documentary is “The Eagle Huntress”. I highly recommend it. I sometimes refer to my “Tipi in progress” as my “Tiny House”. So I’d like to drop a couple pictures here, of my Tiny House in its beautiful fall setting before we get into the Vision Quest. 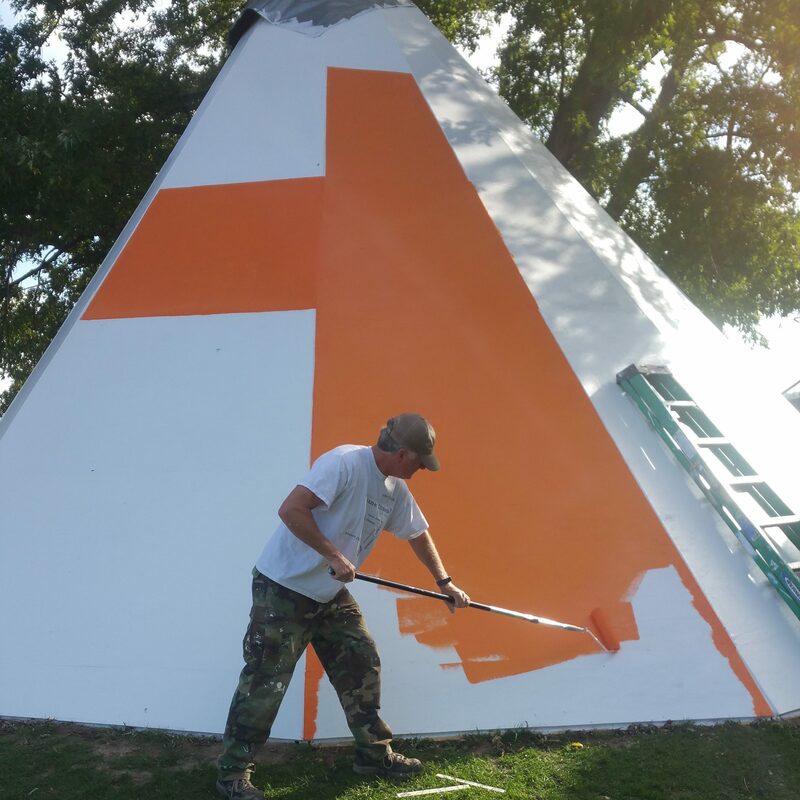 I snapped these pictures the other day and was amazed how beautiful it all was with its mixture of blue in the sky, green in the grass, yellow in the leaves, orange on the cross, and even the white of the tipi. Hope you enjoy.